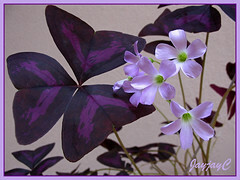 Our Miss February 2009 is none other than this striking beauty, Oxalis triangularis spp. Triangularis, with such impressive foliage in the most unique shape and colors. Just look at those lovely shamrock-shaped leaves in the right image and you’ll know why this plant is commonly known as Purple Shamrock or Purpleleaf False Shamrock. This attractive clump-forming plant is popularly grown for its interesting heart-shaped trifoliate leaves that dance and sway beautifully with the wind, resembling a crowd of fluttering butterflies. So graceful and simply marvelous to observe! Just as beautiful are its clusters of tiny and dainty funnel-shaped flowers, sweetly colored in lavender or pink-lilac. We’ve been growing it in this hanging pot since November, 2007 but only realized about 9 months later that it flourish best in a bright area with filtered sunlight when we relocated it from the frontyard to the courtyard where it is cooler. Seeing how luxuriant it now is makes us so happy that we’ve made the right move. Even its leaves stay beautifully unfolded throughout the day and only fold down when it is dark at night, presenting us more opportunities to admire and enjoy! 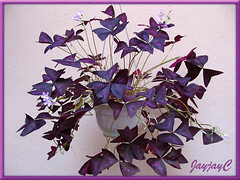 Get more information on this wonderful plant, Oxalis triangularis, here. I am so glad to find your website. It is so hard sometimes to find names of the plants bought in nursery in Selangor/KL area. Most of our plants were purchased from nurseries in Sungei Buluh, including this exquisite Purple Shamrock, which will be a stunner for any garden, especially in hanging pots.